Continental's E-Series laundry equipment can tackle any healthcare cleaning job – and in the process – cut utility and labor expenses and dramatically improve laundry productivity. Most nursing homes, clinics and hospitals are concerned with improving laundry production—getting more done faster! But, quality is also of the utmost importance. With Continental's E-Series commercial washer-extractors, healthcare operations can properly wash a variety of items thoroughly and consistently while improving production dramatically. Sheets, towels, bed pads, blankets, personal items, mop heads and rugs, can all be cleaned using one machine that's properly programmed. Programmability and high-speed extract are key washer capabilities for healthcare facilities. 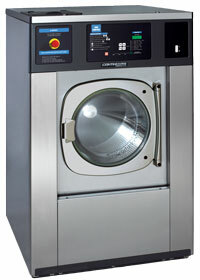 Continental's E-Series laundry equipment – no matter the load – fits the bill. To learn more, view our market segment brochure. High-performance E-Series Washer-Extractors produce extract speeds of up to 387-G force—double the extract of most traditional, hard-mount commercial washers. Facilities can expect to cut dry time by as much as 65 percent, as a result. High-extract significantly boosts laundry productivity and cuts gas consumption! Because it takes less time to complete the laundry, facilities save markedly on labor and overtime. Cleaning chemicals and softeners are used at the appropriate water temperature and cycle, E-Series offers automatic chemical injection capabilities—an essential feature for hospitals and nursing homes concerned about proper removal of body fluids and other contaminants. Auto injection eliminates the need for adding chemicals manually and chemical overuse and waste. It ensures items are properly cleaned every time! Typically, automatic chemical injection can result in a significant savings in detergent costs. For some facilities with little space, the E-Series soft-mount commercial washer-extractor design means the washers can be installed nearly anywhere without concrete foundations or bolts. Of course, these commercial washers are highly programmable so facilities can wash anything from personal items to bed pads and mop heads. In use at laundries worldwide for more than 15 years, E-Series commercial washers feature an easy-to-understand programming system with up to 99 program selections. This high performance laundry equipment couldn't be simpler to operate—just push a button and go! Clara Barton Hospital / Hoisington, Kan.
Brandon Woods / South Dartmouth, Mass. Lutheran Homes / Oshkosh, Wis. Laundry Solutions for Healthcare Facilities Brochure – View the brochure on how Continental Girbau laundry equipment is designed specifically for healthcare facilities. Contact your nearest distributor to request a quote!